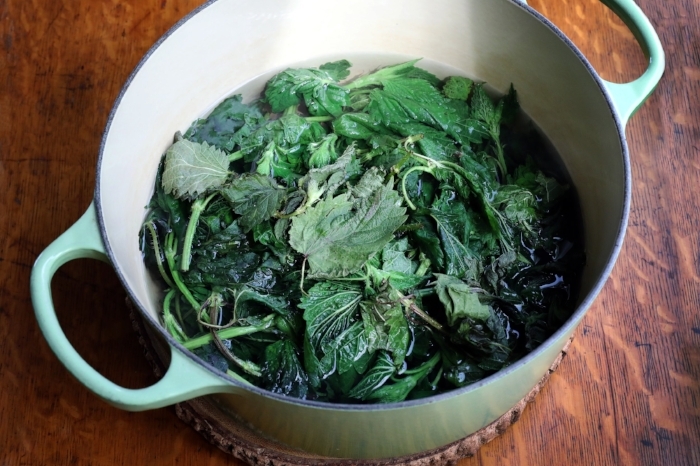 3 cups fresh nettles - you can also add in other spring greens such as chickweed, dandelion greens, cilantro or basil! 1 cup of soaked nuts or seeds of choice: i love using pumpkin and hemp seeds, and pine nuts for a rich flavor! salt and pepper to taste. I use Atlantic grey salt or Celtic sea salt - always unrefined! Soak your nuts or seeds of choice in filtered water over night, covered. Drain and rinse in the morning to help remove the phytic acid which blocks the uptake of essential vitamins and minerals! Roughly chop the garlic then add all of the rest of the ingredients into the food processor and pulse until you reach the desired consistency!! You can have fun with this recipe! Use whatever you have growing in your yard as far as edible weeds and greens go! Get creative and get to know some new spring edibles like dandelion or chickweed or stick to old classics like basil and cilantro! 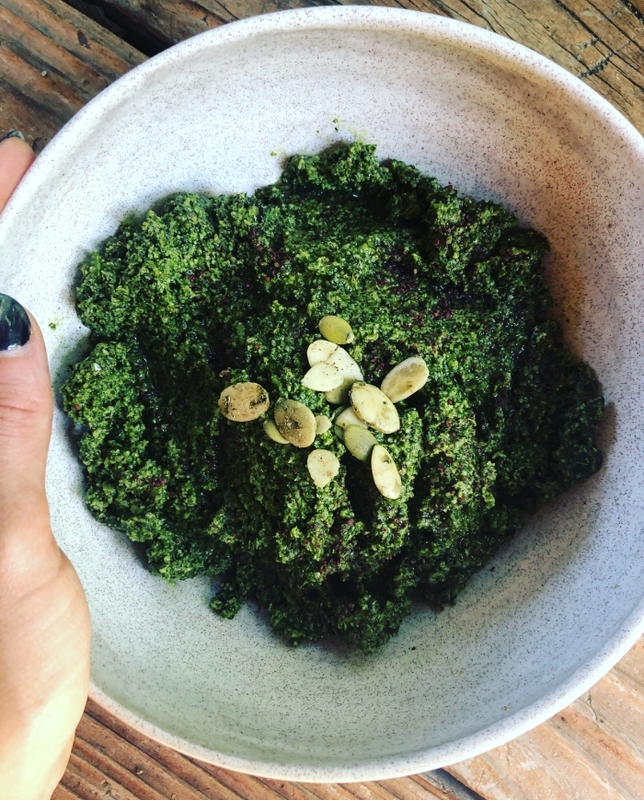 Super simple and delicious medicinal nettle pesto! This pesto makes a tasty spread on crackers, a delicious dip for fresh veggies, or a sauce for pasta. It will keep in the fridge for up to a month and freezes well too. I like to freeze my finished pesto in an ice cube tray for easy single servings! Nettle pesto is full of healthy fats and EFA's, vitamin A, C, B6, riboflavin, thiamine, calcium, lots of iron, potassium, magnesium, zinc, copper and phosphorus + tons of anti inflammatory phytonutrients and antioxidants! Not to mention it can be made nut and dairy free to support your dietary preferences! Nettles are one of the best nourishing and tonic herbs, full of vitamins and minerals that deeply nourish our bodies! They are also a remedy for woman who suffer from chronic fatigue and low energy due to insufficient iron! These prickly friends are so delicious made into fresh pesto, dried for tea, added into broth or infused into vinegars!! Hope you enjoy this delicious and quick, nutrient dense wild pesto! Share your own recipes below!